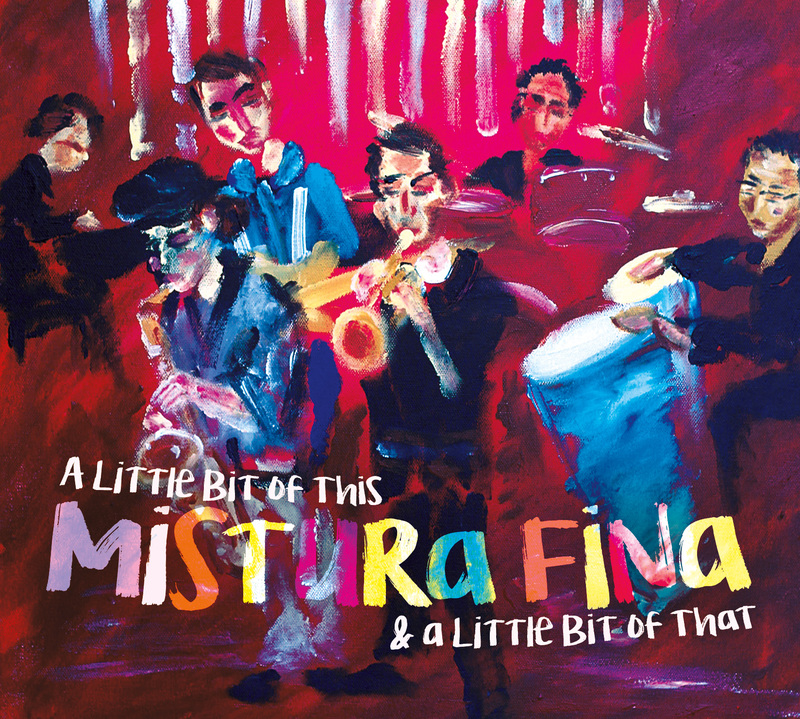 From the opening down beat to the final coda, Mistura Fina’s long awaited sophomore recording is guaranteed to take you on a delightful ride through the world of percussive jazz with a variety of styles sure to please even the most discerning ears! The CD’s title might be A Little Bit of This and a Little Bit of That, but it contains a whole lot of magnificent music that lives up to the group’s name which translate to a fine mixture, indeed! The Denver based group was founded in 2000 by the versatile drummer and percussionist Frank Ayala – originally from Colton, California, he has been a Denverite since his adolescence. Frank has a strong passion for the music of Brazil and is also knowledgeable about candombe, the music of Uruguay. From the inception of the group, bassist Andrew Hudson and the multi-talented saxophonist/keyboardist Alex Nekrasov have been members of Mistura Fina. Their previous release: Proud Spirits, Humble Hearts from 2003 received rave reviews from fans and critics. A Little Bit of This and a Little Bit of That took many years to complete as Frank was determined to release the highest quality production and his goal has come to fruition with this killin’ session that has hit the bull’s eye. Ayala recruited some of Denver’s best musicians to be a part of this recording, from São Paulo, Brasil, Eduardo “Bijoux” Barbosa plays bass on 3 tracks while Andrew Hudson, Ken Villanueva and John Thornburg take turns on bass for the other songs. Hugh Ragin is the outstanding guest trumpeter on 2 hellacious tunes, on Days Like That, Ragin particularly shines with his excellent soloing. Piano playing is handled by several pianists led by Michael Shea on 4 tracks, Justin Adams appears twice with single contributions by Andy Nevala, Adam Revell and Alex Nekrasov takes cares of keyboards on another song. Until a few years ago when he relocated to Baltimore, MD to accept a teaching position, the marvelous percussionist Gary Sosias whose father was in the Xavier Cugat Orchestra, was the first call conguero in Denver, Frank asked him to record with Mistura Fina as a guest for 3 of the 11 selections of this recording. The exciting and unique sounds of the remarkable Russian Alex Nekrasov on saxophone permeate this album from beginning to end. The group’s leader Frank Ayala is heard on drums as well as on specialty hand percussion for Agua de Luna, he also plays the candombe drums on Candombe para Gardel. Now that you have read a little bit about the group and a little bit about the musicians, it’s time to talk about that magical elixir for the ears called music, and oh my, this album is chock full of potent doses! The opener Centro Habana starts the sojourn with its captivating riffs and brilliant solos by Alex on sax and AnDre Mali on trumpet, from Cuba to Brasil for Baião and Don Quixote penned by Milton Nascimento. The journey continues to Uruguay for Candombe para Gardel which is a tribute to Argentina’s legendary pioneering tango singer Carlos Gardel who was killed in a plane crash in Medellín, Colombia in 1935. This track features the Peruvian guitar virtuoso Manuel Molina. After another Nascimento composition, we get to hear what this writer believes to be the tour de force of A Little Bit of This and a Little Bit of That, the incredible Sud Africa, a composition of the Uruguayan candombe master Rubén Rada arranged to perfection by Frank Ayala and performed majestically by the group and special guests. Ricardo Pena and Amy Biondo from Los Bohemios group chime in on vocals which has Ricardo interjecting some Rubén Bladesesque singing with Ryan Mullen on cajón-the box drum, popular in Perú and Cuba. Thelonious Bone plays guitar and Zay Ríos pounds the djembe and recites his original poem to conclude the message song. Heading towards the finish line, back to back scorchers, El Cura and To Brenda, With Love, both written by the NEA Jazz Master, Paquito D’Rivera will have your head bobbin’, your feet tappin’ and your body swayin’. Corrupio is an ideal finale, a dual guitar led selection highlighting Leonor Hprian and Thelonious Bone and the multi-talented Alex playing the melodica on this closer that will soothe your soul and leave you tingling in anticipation of hearing the recording again…and again.